It also leads to an abundance of storylines for the second major of the season. U.S. Opens are often known for their courses, but the prevailing theory this time around is that the course (which you can read about here) is going to play a secondary role to the players. Hopefully that's the case after three straight years of consternation. Here are nine storylines to keep an eye on ahead of this year's U.S. Open at Shinnecock. 1. Lefty's slam: The first two storylines are also the most obvious. Here's my take on Phil Mickelson: I think he has two more real chances to touch off the Grand Slam. He turns 48 on Saturday and will be 49 next year at Pebble Beach. After that, it's Winged Foot, Torrey Pines, The Country Club and Los Angeles Country Club. Could Mickelson win a U.S. Open on one of those courses at age 50 or beyond? Sure, he could, but I think his last best chances are this year and next. That's not exactly a hot take, but it's worth noting, especially given the fact that his last two appearances at Shinnecock have both been top-five finishes. So who will win the 2018 U.S. Open, and which long shots are set to stun the golfing world? Find out by visiting SportsLine now to see the U.S. Open projected leaderboard from the model that's nailed four of the last five majors heading into the weekend. 2. Tiger's last decade: This is my sixth year covering golf but just my third U.S. Open with Tiger Woods playing. He has been in the field just three times since 2010 and doesn't have a top 20 finish. Still, he's been splendid so far in his most recent comeback. He's top 10 in strokes gained tee to green (within the range of players I expect to win this event) and obviously knows how to win U.S. Opens, which he last did 10 years ago. How much money could you have won by betting against Woods winning a major in the 10 years following that splendid one at Torrey Pines? For Tiger to get his first victory in five years at this place, in this tournament, might be too much to ask. Even for him. 3. Fowler's first? I wanted to pick Rickie Fowler this week. I really did. I picked him for the Masters, and he almost made good on it. I couldn't pull the trigger because Dustin Johnson might be playing chess to Fowler's (and everyone else's) checkers, but his quest as one of the handful of big time players without a major is fascinating. 4. Spieth's (so-called) struggles: Everything is relative, especially when you get into the range of top five players in the world. Jordan Spieth is No. 4 on the PGA Tour in strokes gained from tee to green. This is good. It's in the class of players who could win this golf tournament. But he's also not finished in the top 20 in any of his five events since the Masters and currently ranks No. 190 (!) in strokes gained putting. Cause for concern? Maybe, maybe not. But it's certainly a massive talking point heading into the second major of the year. On the flip side, there's this. 5. J.T. was the quietest No. 1: Justin Thomas was poised to enter this event as the seventh No. 1-ranked player in the world in the last seven years. Then Johnson torched the FedEx St. Jude Classic field for win No. 18 and took it back from him. Still, it feels like Thomas is flying in a little bit under the radar. I don't know if he's going to win this week, but it would definitely concern me if I'm in this field that one of the top two players in the world (who has somehow followed his elite 2017 year with one that's nearly as impressive -- if not more so -- in 2018) isn't really being talked about. 6. D.J. 's crown jewels: The No. 1 player in the world (again) is coming off a masterpiece at TPC Southwind in Memphis. Aside: You have to hole out your final shot of the tournament for a six-stroke win over Andrew Putnam to be considered a masterpiece. Now, he has a chance to win two U.S. Opens in three years and add Shinnecock to his embarrassing array of conquered courses: Riviera, Pebble Beach, Oakmont, Cog Hill, Doral, Crooked Stick. When I read pieces like Andy Johnson's on Shinnecock, I can't help but think he's the one to beat at this classic venue. Shinnecock's variety is unparalleled in the United States. It requires every club and shot in a professional's arsenal. Shinnecock is a course that won't favor a particular style of play. It has enough width to allow the shorter player to use accuracy while not taking the driver out of the long player's hands. The green complexes' rolled-over edges and short grass surrounds create a razor thin margin of error. The undulating fairways will produce a bevy of uneven lies that, coupled with ever-changing wind directions, will make it excruciating to control distances. A shot one yard from perfect can mercilessly tumble 30 yards away. The severe nature of the slopes of the greens will test a player's touch and also command respect and thoughtful approach play. Shinnecock Hills will expose any and all flaws in a player's game. It's the finest major championship venue in the game because it asks the widest variety of questions to players. Shinnecock Hills will crown the week's most well-rounded and skilled golfer. 7. Reed's follow-up: Hey guys, remember me? The aftermath of Patrick Reed's Masters win was about as quiet as it could have been given Reed's age (27), nationality (American) and what could lay ahead of him (more majors). He flirted with contention last year at Erin Hills, and he could certainly do so again this year at Shinnecock. Can you imagine Reed holding a press conference at Carnoustie in a month with a pair of majors under his American flag-themed belt? 8. Ryder Cup implications: Such is the setup for Ryder Cup points that an American golfer can rise from deep in the rankings, win a major and catapult himself onto the team. These events provide so many Ryder Cup points that it would be nearly impossible for somebody like Jimmy Walker (15th), Luke List (20th) or Billy Horschel (23rd) to not make the team following a U.S. Open win. Keep that in mind when you're staring at a third-round leaderboard that looks like our 2017 third-round leaderboard. 9. Rory's aggregation: Take any non-Tiger, non-Phil collection of three random golfers at the top of the world rankings, and it's a pretty decent bet that Rory McIlroy has more majors than those three golfers combined. For example: Bubba Watson, Rickie Fowler and Jason Day (average world ranking: 12, combined majors: three). Or, say Justin Thomas, Dustin Johnson and Hideki Matsuyama (average world ranking: 4.3, combined majors: two). It's really startling to think about the fact that, despite all the criticism he's received and opining about gym work and putter woes, McIlroy still has four of these things. 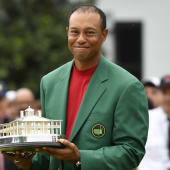 If he can add another U.S. Open, especially at a place like Shinnecock, especially before the age of 30, his status as an all-time legend will only grow.